K+ secretion in the distal nephron. K+ is taken up into cells across the basolateral membrane via Na-K-ATPases (blue oval) and secreted into luminal fluid via apical ROMK channels (yellow cylinder). Sodium (Na+) reabsorption via ENaC (green cylinder) depolarizes the apical membrane potential and provides the driving force for K+ secretion (indicated by dotted line and plus sign). Thus, increased Na+ delivery (indicated by black line) would stimulate K+ secretion. 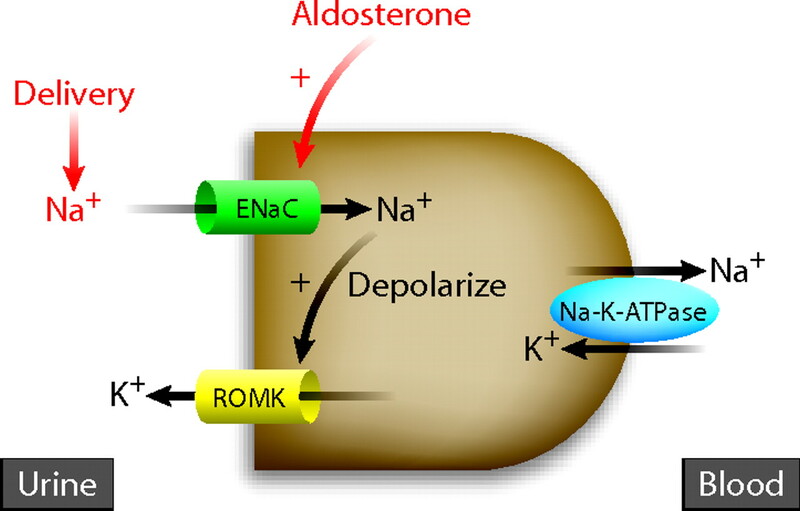 Aldosterone increases sodium reabsorption via ENaC to stimulate K+ secretion (indicated by red line). Mechanism for intracellular magnesium to decrease K+ secretion. A ROMK channel in the apical membrane of distal nephron is depicted. (A and B) At zero intracellular Mg2+, K+ ions move in or out of cell through ROMK channels freely depending on the driving force (i.e., not rectifying). At intra- and extracellular K+ concentrations of 140 and 5 mM, respectively, the chemical gradient drives K+ outward. An inside-negative membrane potential drives K+ inward. Inward and outward movement of K+ ions reach an equilibrium at −86 mV (i.e., equilibrium potential [EK] = −60 × log 140/5). When membrane potential is more negative than EK (e.g., −100 mV, a condition that rarely occurs in the apical membrane of distal nephron physiologically), K+ ions move in (influx; see A). Conversely, at membrane potential more positive than EK (e.g., −50 mV, a physiologic relevant condition), K+ ions move out (see B). (C and D) At the physiologic intracellular Mg2+ concentration (e.g., 1 mM), ROMK conducts more K+ ions inward than outward (i.e., inward rectifying). This is because intracellular Mg2+ binds ROMK and blocks K+ efflux (secretion; see D). 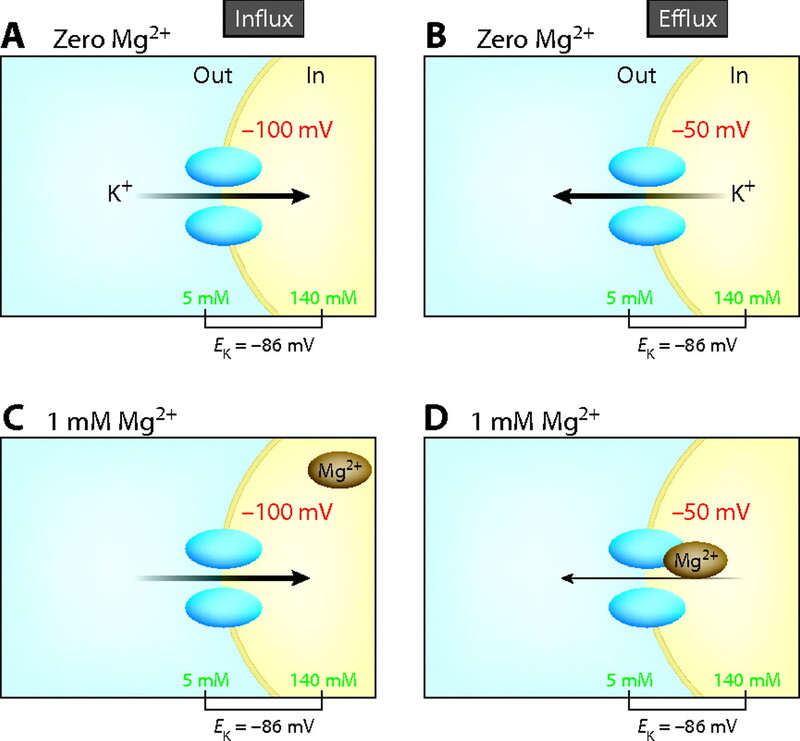 Influx of K+ ions displaces intracellular Mg2+, allowing maximal K+ entry (see C). This unique inward-rectifying property of ROMK places K+ secretion in the distal nephron under the regulation by intracellular Mg2+. Note that, though inward conductance is greater than outward, K+ influx (i.e., reabsorption) does not occur because of membrane potential more positive than EK. Summary of effects of intracellular magnesium and driving force on K+ secretion.